There are two bellwether dishes that if cooked well mean there is a bloody good chef in a bloody good kitchen – squid and zucchini flowers. My sister is the squid connoisseur, and I can never go past zucchini flowers. It was two years ago when we first tried one of the local restaurants, and discovered it had both as entrees. After the first mouthful PYRAMA came to be our favourite local restaurant. It is owned and run by a young and enthusiastic couple, Jim, in the kitchen and Karen, front of house. They have a wonderful, reasonably priced restaurant where the food is excellent, the wine list interesting, and the ambience just what I want when I go out to eat. As part of the extraordinary Pyrmont Wine and Food Festival it was only natural that we would visit PYRAMA for a special night of food and wine. His Nibs and I could have spent an entire week going from one restaurant to another during this festival, consigning our sporadic diet to parts unknown. Our schedules, however, wouldn’t permit such indulgence, but we have already penciled in May next year in the hope that the Festival is repeated. And so it was that Sister Ruth and friends joined us at Pyrama for a four-course meal with pre-selected wines that were to match. The food was great. I am a permanently designated driver so I don’t drink, but will inform you of what family and friends thought of the wine that came with each course. 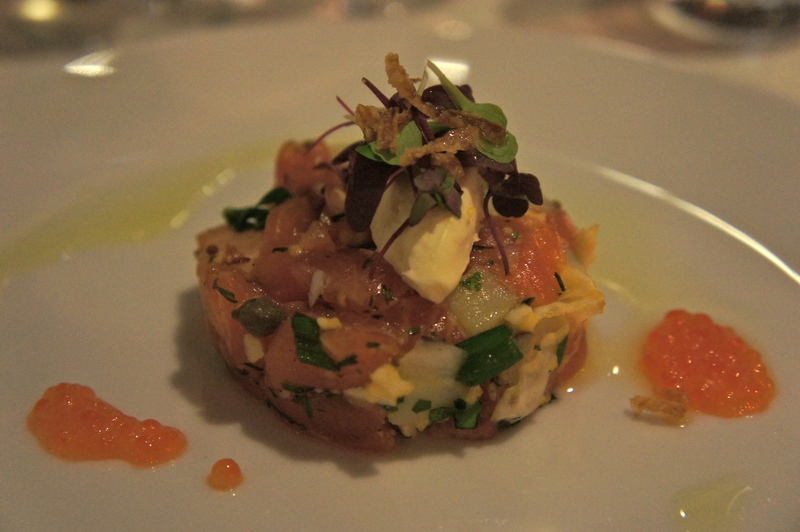 For starters we had a Petuna salmon tartare with lemon crème fraiche, potato and capers. Additional ingredients identified included shallots, red onion, crushed coriander seeds, roe and topped with deep fried onion (for crunch). The salmon was made up of two kinds, natural and cured. It was delicious, light and just right as a starter. It was a nice mixture of flavours that go pop in your mouth at different stages as each ingredient follows its own choreographed time line. The wine served with the tartare was a Mudgee 2010 Miramar Fume Blanc. The drinkers at our table were split evenly between those who predominantly drink white, and those whose preference is a red. The method of making the wine is different for a fume (apparently), and results in an oaky taste to the wine. Everyone liked the wine, and said that it went well with the dish. The entrée was worth starting world war 3 over. 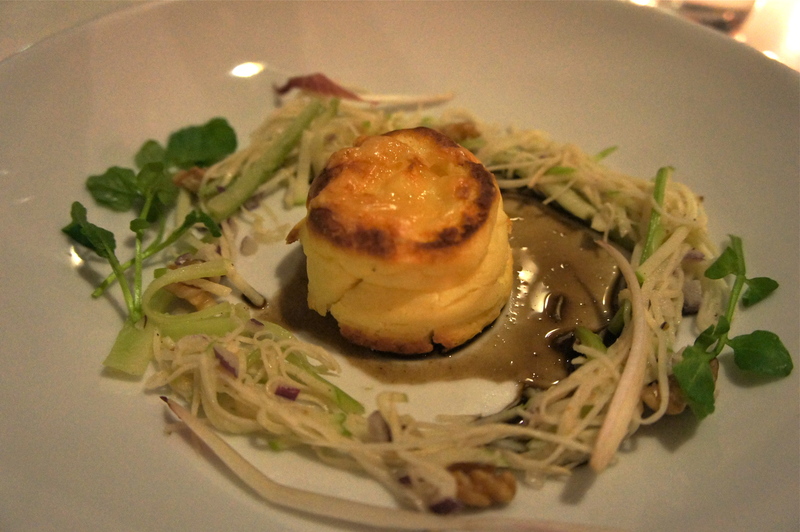 It was a twice-baked gruyere soufflé with mushroom jus. Gruyere is such an overpowering cheese, and I am so heavy handed with ingredients I’m never game to include it. The flavour was strong but delicate, if that makes any sense at all. The balance was just right. Words to describe the entrée included gorgeous and fabulous. I didn’t use any words but rather grunted my way through the entrée, and then had to be restrained from licking the plate. The wine that went with this soufflé was a 2009 Miramar Unwooded Chardonnay, which had a “lovely after-taste”. His Nibs is very fond of a chardie, and stated that this was one of the better ones he had tasted in a long time. For me, this is high praise indeed. 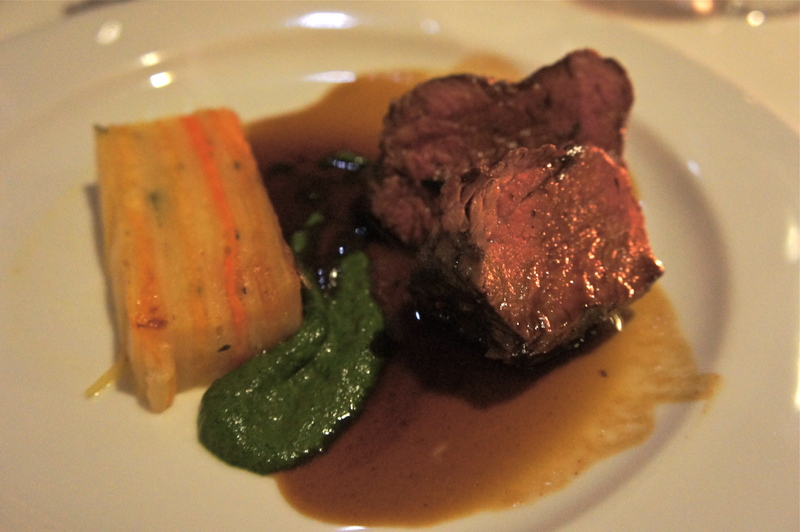 A roast dry-aged fillet of beef with root vegetable & thyme gratin, creamed spinach & red wine jus was the main course. The beef was a great piece of meat cooked to perfection, crisply seared on the outside, and red and moist on the in; the root vegetables, layers of potato and sweet potato, were to die for, and the meal was enhanced with a big, big, some said huge, red. The red was a 2009 Quilty Black Thimble Shiraz, and was described by our red drinkers as ‘stunning’. It was agreed that it could only be drunk with red meat because it was so ‘big’. Order forms were taken by those at our table to purchase this wine. The choice of wine by the wine-maker made the chef’s job difficult for the dessert. The wine was a 2009 Quilty Stitch Cabernet Sauvignon, which was smooth as silk, with a slight berry driven sweetness, and a hint of oak. The wine was an absolute winner on its own, and had our red drinkers reaching for the order forms. I was reliably informed that this is a red wine you can have as a stand-alone requiring no food to enhance its quality. 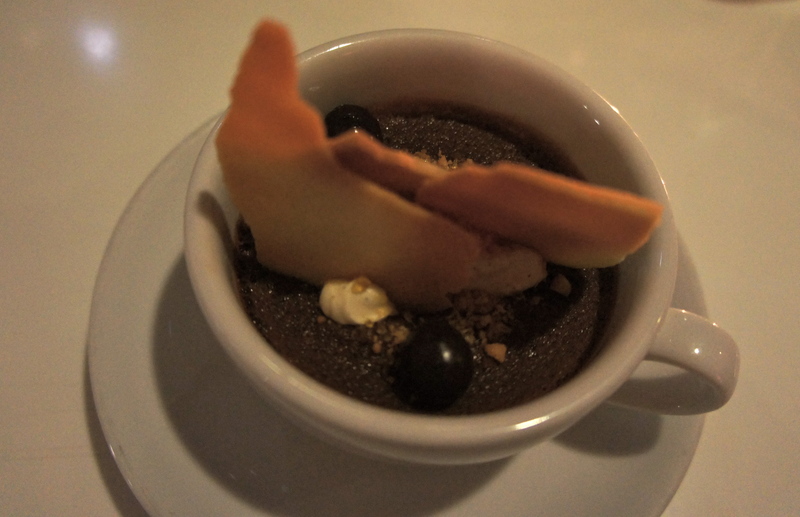 The dessert was a chocolate heaven: a French chocolate & praline pots de crème. Smooth, rich without being cloying, and a perfect end to a perfect meal. The wine as good as it was, however, did not match the dessert. His Nibs said that a glass of Tokay would have been just the ticket for this great dessert. 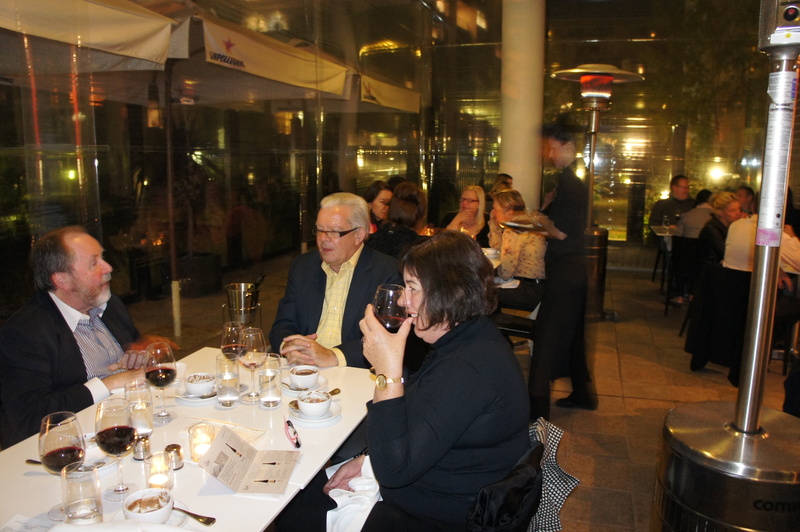 $85 per head was the cost of the evening for four courses and very healthy servings of fine wine. We rolled down the hill to get the necessary transport home after a very satisfactory evening. PYRAMA is worth a visit. Posted in Food, Politics, Sport, Kitchen, Reviews and tagged Miramar wines, Mudgee wines, Pyrama Restaurant, Pyrmont Food & Wine Festival, Quilty wines. Bookmark the permalink.